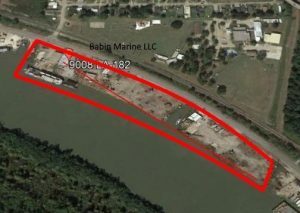 Babin Marine, L.L.C. offers a wide variety of services in the marine industry, oil field industry, and the construction industry. The marine industry includes boats and barges for charter, sales, docking, fleeting services, stevedoring, industrial equipment sales and boat and barge repairs top side. The oilfield industry includes inshore support, pipelines, platforms, barge and tug rental with crews, pile driving, and dredging. 1800′ of Bulkhead and 12000Sft of Warehouse space. We also have waterfront storage for boats with shore power and portable water. Customers have access by both waterway and roadway to vessel/boat storage area. Call Babin Marine, L.L.C. Today! Check out our Ports and what we have to offer you!